In Epcot’s Canada pavilion, while working their way down to reservations at Le Cellier or to a viewing of O Canada!, guests pass by one of the most enchanting gardens in all of Walt Disney World. The quilted patchwork garden known as Victoria Garden change seasonally, but is always gorgeous, as is the real world garden it is based upon. The plaque at the entrance to Victoria Gardens states that “These gardens are a reminder and a reflection of horticulture as a work of art and a labor of love.” From this posting guests can also learn that Victoria Gardens were inspired by Butchart Gardens, which is a true work of art and labor of love. 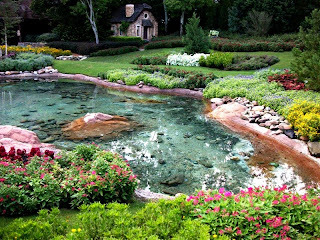 Butchart Gardens, located just outside of Victoria, British Columbia, began life as a limestone quarry. As Robert Pim Butchant depleted the limestone in the excavation area in the early 1900s, his wife Jennie Butchart began revitalizing the area as gardens. In 1906, a Japanese Garden sprung up on the site and is soon followed by Rose, Sunken, and Italian Gardens. Although the limestone had been completely exhausted by 1909, the gardens, known as Benvenuto, continued to thrive. Plants grown for seeds to be sold, artifacts acquired from worldly travels, new plantings, and fountains, wishing wells and other works of art are just a few of the additions that have kept the grounds of Butchart Gardens blooming. The flowing, flowering rows of Victoria Gardens are smaller and less thematic than their inspiration, Butchart Gardens, but the craft showcased in the World Showcase plot is no less mesmerizing or deserving of a visit.